Have you ever played Candy Crush Saga or a similar game on your tablet, phone, or computer? If you have, according to the game developer, King, you’re in good company, with over 90 million other players. The game is free. At least the download is free. The more candy you match up, the more points you get. I found the first levels pretty easy. I cruised up to level 20 and was feeling that for a middle-aged mom, I was not a bad gamer. Then it started to get tougher. I started needing to play the same level over and over to advance―so I had to spend more time to progress to the next level. Then, I had to use the gold they gave me to buy special candies or extra moves to clear a level. One night as I played before bed, tired and blowing off steam after a tough day, they got me to spend money. I couldn’t clear a level after many, many tries. Having exhausted the gold that came with the game, I gave in and bought some gold so I could advance to the next level. My free game was no longer free. I got sucked in to spending money. Not that much, just $5. But that wouldn’t be the last time. Trying to eat healthfully and watch your weight in America today is a lot like playing Candy Crush. As the game draws us into spending time and money, the food environment draws us into eating more calories than we planned, or really wanted to eat. The game rewards you with stars, words of praise, and smiling characters. The food system rewards us with the perfected crunch of a Dorito engineered by food scientists, an afternoon boost of caffeine in a Coke, a toy with a Happy Meal, or the feeling that we got a deal by ordering the Double Gulp instead of the Big Gulp at 7-Eleven. That inexplicable desire to get to the next level of Candy Crush is similar to how the food environment puts us in situations where we eat when we otherwise wouldn’t. A candy bar from checkout, a huge bucket of popcorn at the movies, or a donut at a morning meeting when we’ve already had breakfast. How many of you have appetizers before dinner at home? Yet restaurant menus are loaded with thousand-calorie options. Getting to the next level of a game isn’t important. But in the heat of that gaming moment, you’re willing to pay to get there. It’s like when you’re not feeling hungry until you catch a whiff of a Cinnabon when shopping, then find yourself purchasing those previously-unwanted 800 calories. You only get a limited number of moves to get to the next level of a game, just as we only get a limited number of calories if we want to maintain a healthy weight. In the game, you can get extra moves for a small price. The price of eating extra calories is steeper―overweight, heart disease, and diabetes. The game prompts you to play on―asserting that you are so close to getting to the next level and can play on for just nine gold bars. Food advertising reassures us that we can squeeze in a splurge. After all, we deserve a break today. Or stressing that the food will make us feel better; we can have a Coke and a smile. It’s just this one time. Live for now, Pepsi literally tells us. We can make up for that soda, extra slice of pizza, or cookie later. Most people resist temptation regularly, but we can’t always be on high alert. It’s hard to resist such sophisticated marketing and so many opportunities to eat highly palatable food. It’s especially difficult when willpower reserves are low―when we’re tired, stressed, or distracted, like when we’re shopping with our kids, rushing through an airport, or distractedly ordering lunch with more pressing issues on our mind. Like my $5 of Candy Crush gold, often the number of calories we overeat doesn’t seem like much. It’s just a bagel at a morning meeting, a Frappuccino on the way into work, or a large instead of a small fries with lunch. But just as the makers of Candy Crush have built a profitable business on lots of people’s small purchases, calories add up. Candy bars are pushed on us at checkout not only at grocery and convenience stores, but also at hardware, bed and bath, electronic, office supply, toy, drug, clothing, and other retail stores. Soda is everywhere, from ballparks and bus stations to office buildings and shopping malls, and in virtually every restaurant and movie theater. Even if you resist temptation most of the time, giving in occasionally could be enough to tip the scales. The whole obesity epidemic is explained by fewer than 100 extra calories per person per day. You play a game for fun, and eat for enjoyment. Companies are, of course, in it to make money. It feels like our food choices are solely a matter of personal choice and that we’re in complete control, but food companies study our every move to maximize profits and sales, which means getting us to buy and eat more food. Marketers are studying human nature and hijacking our biology to get us to buy more food than we want or need. The Center for Science in the Public Interest works on nutrition policy to ensure that people can make their own choices about what to eat. In addition to having the freedom to proactively make choices about what to eat, people also need freedom from being pushed into eating calories they didn’t want. What food is available, food formulations, package and portion sizes, price, and where food is placed in a retail store or on a menu affect which foods and beverages people buy and how much they eat. Unfortunately, too many of these factors work against us and make it difficult to eat well and maintain a healthy weight. It’s not impossible to eat well, but all too often it’s like swimming upstream. We need thoughtful approaches to improving access to healthy options at work, in restaurants, schools, day care centers, vending machines, convenience stores, and other places food is sold and served. Companies should use their marketing genius to support health, rather than undermine it. FDA regulations and state and local policies have resulted in an 80 percent decrease in the amount of trans fat in the food supply, reducing heart disease and health care costs. When Disney started offering healthy beverages and fruits and vegetables as the side dishes people automatically receive with children’s meals, two-thirds of families stuck with these healthier options. Google moved M&Ms out of sight at their office snack station, and reduced employee calorie consumption by 3 million calories over 7 weeks. Stronger national nutrition standards for school lunches have led to kids eating more fruits, vegetables, and whole grains. Calorie labeling on menus has led chain restaurants to reduce the calories in standard menu options. Supporting healthy eating can be through national, state or local policy, industry practices and product reformulations, worksite wellness, institutional change, or community action. 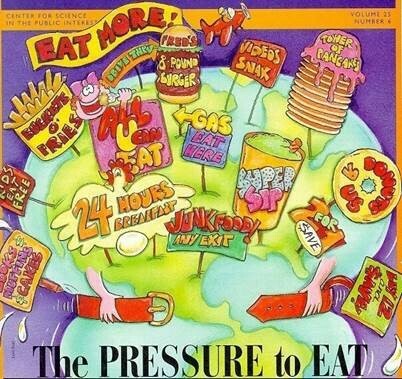 Food companies and fast-food restaurants have a right to produce and aggressively market unhealthy foods. But is it right? A video game costs you time and perhaps a little money. Poor eating habits can cost you your life. After smoking, our fatty, salty, high-calorie diets are the leading cause of death, disability, and high health care costs due to the diabetes, heart disease, stroke, and cancer they cause. Candy Crush is only a game, obesity is an epidemic. Supporting Americans’ efforts to eat well and watch their weight is a pursuit we can’t afford to lose. Margo Wootan is the nutrition policy director at the Center for Science in the Public Interest. Read more about CSPI’s work here. Margo Wootan is the nutrition policy director at the Center for Science in the Public Interest.